New Haggadahs and seder-supplements for the Passover table. There’s something for everyone, including "Marvelous Mrs. Maisel" fans. For someone who wants a – literally – hands-on Haggadah, there’s “Unbound: The Recreated Haggadah,” self-published by Eli Kaplan-Wildmann. Wildmann, a theater creator and designer in Jerusalem who studied at NYU’s Tisch School, has created a Haggadah that contains the standard Hebrew and English text, sans commentaries, but in an innovative form. Printed on slabs of thick, high-quality cardboard, each about double the size of a paperback book, all tied together by a red sash that loops through the pages’ upper righthand corner. The collection is unwieldly, probably difficult to handle at a crowded seder table, but certain to encourage discussion and questioning. None of the pages, illustrated by beautiful graphics and accompanied by a small booklet of the Hallel Psalms and a spinning wheel with images of The Four Children and “An Unbound Guide” with suggestions for optimum use of the Haggadah, contain commentary. The design of Kaplan-Wildmann’s Haggadah (unboundjerusalem.com) is its own commentary. This is ideal for an ecletic, artistic, Jewishly knowledgeable crowd. The ubiquitous “Maxwell House Haggadah,” almost 90 years old, which began as an advertising vehicle for the firm’s kosher-for-Passover coffee, is not nearly as ancient as some versions of the seder night book of readings and rituals, some of which date back at least a millennium. But it is arguably the best-known Haggadah in the United States. Now, after occasional changes over the decades to update its language and graphics, it is rebranding itself again. By reissuing our grandparents’ Haggadah. 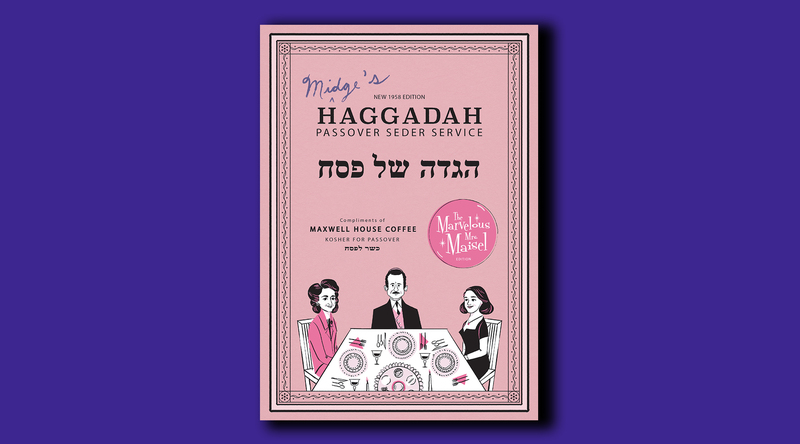 Maxwell House’s retro “Midge’s Haggadah Passover Service” is a paean to Amazon Prime Video’s Emmy-winning “The Marvelous Mrs. Maisel,” a comedy-drama about a Jewish comedienne in the 1950s. The facsimile version is the one that Midge Maisel and her Jewish family probably would have used in 1958. 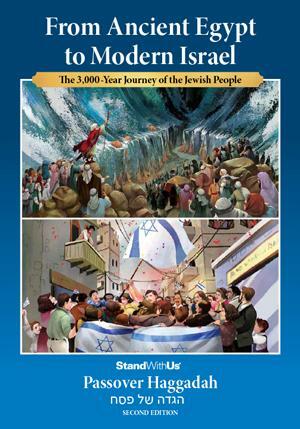 Amazon.com customers who order Maxwell House Coffee will receive a free copy of the limited-edition Haggadah. Not exactly a Haggadah, the “Reordered” toolkit produced for the second consecutive year by the Joint Distribution Committee, international aid-and-education arm of the organized Jewish community, is a guide for young seder leaders and participants who come to the Passover-evening meal Haggadah in hand. It comes in a matzah-style box is a collection of readings, recipes, toasts. 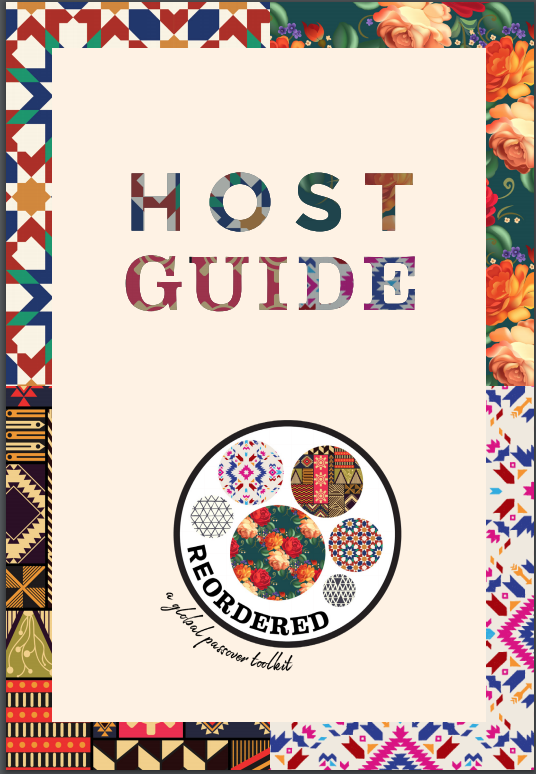 explanations, stories, postcards, coasters and a host guide, much of the contents centered around four of the communities where the Joint is active – Poland, India, Greece and Argentina. 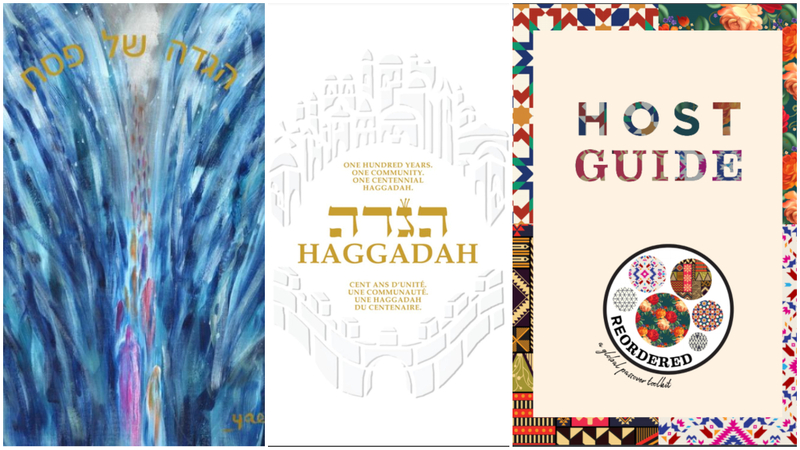 The OU Press, the publishing arm of the Orthodox Union, which is becoming a major player in the Jewish publishing world, has issued two new Haggadot this Passover season. One is the product of a veteran New Jersey pulpit rabbi; the other, the collected Pesach-related thoughts of a prominent deceased Modern Orthodox rabbi who served as one of his movement’s philosophical thinkers in the generations after the Holocaust. Both books are full of profound-but-lengthy explanations of seder readings and rituals, and some sections are better suited for preparation before the evenings of yom tov than reading at the holiday table. Both are weighty and valuable. Both are geared for seder participants who have some grounding in and understanding of Jewish erudition, rather than for neophytes. “Unlocking the Haggada: The Complete Haggada with In-Depth Commentary,” (OU Press) by Rabbi Shmuel Goldin. Illustrations by Shifra Goldin, published in conjunction with Gefen, features the wisdom of Rabbi Goldin, emeritus spiritual leader of Congregation Ahavath Torah in Englewood, N.J.
“Faith and Freedom Passover Haggadah, With Commentary from the Writings of Rabbi Eliezer Berkovits,” combines the traditional Haggadah text with insights culled from the writings of Rabbi Berkovits (1908-1992), a Romanian-born philosopher and theologian who served in Germany before World War II, then subsequently in England, Australia, the United States and Israel. The words in his Haggadah were compiled and edited by Reuven Mohl, a New York dentist who was ordained by Rabbi Zalman Nechemia Goldberg of Jerusalem, and lives in Teaneck, N.J. The book is a reflection of the family seders that the late rabbi conducted. “To sit at the Berkovits Seder table on Passover eve was a … quintessential moment that captured something formative in the passage of generations,” his children write in their introduction. A large part of his approach to the seder’s theme, his dominant life’s philosophy, is Jewish continuity through the lens of confrontations and exile. Rabbi Goldin’s Haggadah, which follows his series of “Unlocking the Torah Text” series of commentaries on the Five Books of Moses, features introductory essays and provocative discussion questions, many of them exploring the intricacies of the Haggadah. For people who find the contents and sequence of the Haggadah perplexing, the rabbi attempts to put it all in order through historic, halachic, and “experiential” perspectives, sometimes offering alternatives explanations for Pesach customs. 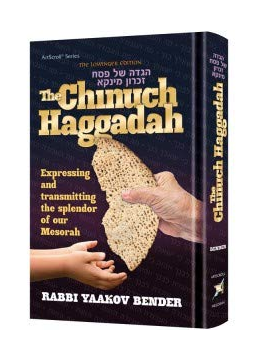 “The Chinuch Haggadah: Expressing and Transmitting the splendor of our Mesorah,” by Rabbi Yaakov Bender. 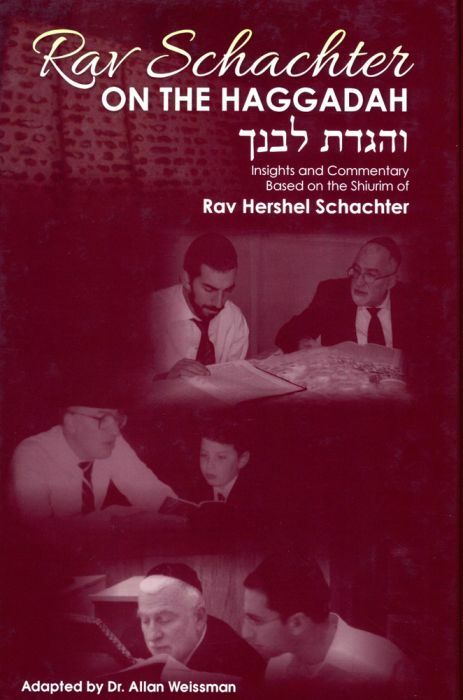 “The Rav Schwab Haggadah,” compiled from the lessons and writings of Rabbi Shimon Schwab. Two Haggadahs by prominent Orthodox rabbis, undoubtedly aimed — by virtue of the language and concepts — at a Jewishly erudite readership but accessible to seder participants of any level, but two distinctly different books. Rabbi Bender, a prolific author and tireless community advocate who serves as Rosh Yeshivah of Yeshiva Darchei Torah in Far Rockaway, Queens, offers a panoply of stories, of his life and of sages from various times, that illustrate seder themes. “Chinuch” is Hebrew for education, and while the style of the rabbi’s Haggadah is appropriate for a young reader, it has value for seder participants of any age. Rabbi Schwab, the late German-born leader of the Yekke community in Manhattan’s Washington Heights neighborhood, has a more scholarly, academic approach, citing the opinions and writings of classic sources and commentators. His posthumous Haggadah is the work of his grandson, Moshe Schwab, who culled his grandfather’s voluminous writings and speeches about Passover and Passover-related subjects. The short length of many of Rabbi Bender’s vignettes and anecdotes lend themselves easily to reading at the seder table; Rabbi Schwab’s insights, many of them comprehensive, are best read and digested in advance, as preparation for Pesach night. The Haggadot that Rabbi Dovid Bashevkin has seen at seder tables usually come in two varieties – graphically forward ones for children, and commentary-driven ones for adults. The seders that the rabbi has attended usually feature kids reading commentaries their teachers prepared for them in day school, and adults reading lengthy explanations about the evening’s rituals from the standard Haggadot in their hands. Rabbi Bashevkin, director of education for the Orthodox Union’s NCSY youth organization, wanted another type of Haggadah for the teens and college-age men and women he is trying to reach. 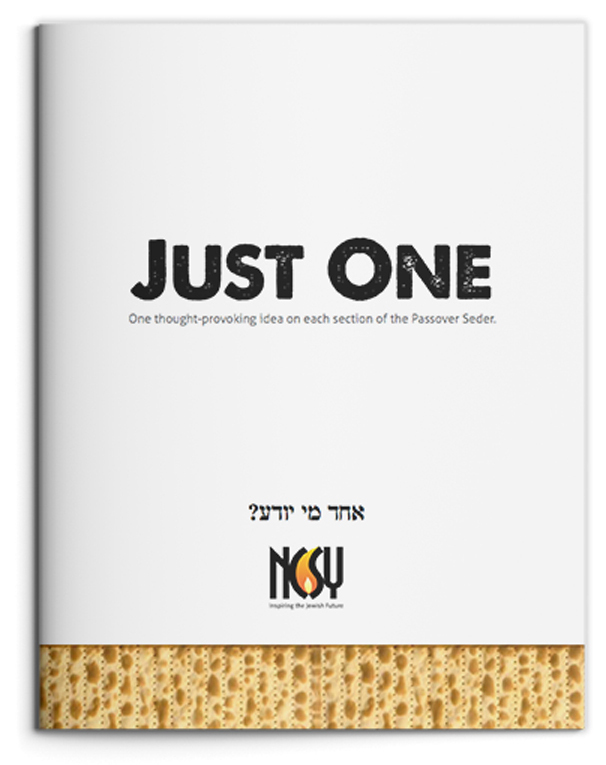 The result is “Just One: One thought-provoking idea on each section of the Passover Seder,” published by NCSY (ncsy.org/ncsy-haggadah-order/). Though NCSY is an Orthodox organization, Rabbi Bashevkin’s Haggadah is an unorthodox one. Instead of extensive commentaries found in most Orthodox Haggadot, his offers, as the title implies, a single discussion topic, often supplemented by related essays or newspaper articles by such people as Rabbi Jonathan Sacks or author Bruce Feiler, none jumping to another page. And the full-color graphics, by designer Rachel (First) Olson, are striking. Musical notation, the Pyramids, a photograph of Mark Twain, a hand holding a heart – whatever illustrates that page’s theme. By commentary, he means the pithy essays and questions he wrote. Many Haggadahs seek to fulfill the imperative of making the seder participant feel that he or she is experiencing the exodus from the biblical land of slavery on the journey to the Bible’s Promised Land. The StandWithUs Passover Haggadah: “From Ancient Egypt to Modern Israel,” published by the Los Angeles-based pro-Israel advocacy organization, brings the reader to contemporary Israel. With color drawings of biblical and historical themes, essays that provide background about the exodus story and subsequent Jewish events, a useful guide to “The Seder Plate of the Jewish People,” an essay on “The Oppression Of African Americans And Jews,” and photographs of Israeli sites, the Haggadah makes a tactile connection between ancient Canaan and modern-day Israel. This is not a Haggadah (StandWithUs.com) for BDS supporters. Unapologetically making a pitch for Israel and Stand With Us activities, the Haggadah offers “Memorable Quotes” about Israel and Israelites by U.S. leaders, Israeli leaders, “Arab Friends of Israel,” musicians and creative artists. There’s maps and charts and “Facts About Israel.” And the text for the phrase “Next Year in Jerusalem” that concludes the seder. That phrase appears twice in this Haggadah. “How about a Haggadah?” she suggested. 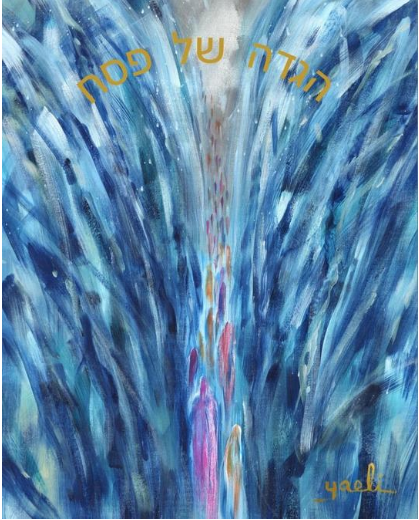 “Breaking Away,” a self-published, limited edition Haggadah, features three dozen of her impressionistic paintings of exodus themes, the standard Hebrew and English text, and some dvar Torah essays about the holiday by Rabbi Yaakov Shapiro, a Far Rockaway scholar. A self-taught artist, Vogel (yaelifineart.com) has worked fulltime in that field three years (yaelifineart.com/Haggadah). She produced separate Ashkenazic and Sephardic (with some textual differences from the familiar wording) versions of the Haggadah. Vogel is now back at work on her usual Judaica work, she said. “I’m still painting every day.” Her next yom tov project: an illustrated Purim Megillah. The tri-lingual creation (Hebrew, English and French), the work of the Women’s Philanthropy division of the city’s Jewish federation, honors both the city’s rich Jewish history and the even-more-venerable aspects of Passover. It features explanations of Ashkenazi and Sephardi holiday customs and traditions, “reflections” from community members, family recipes, and artwork by local artists. 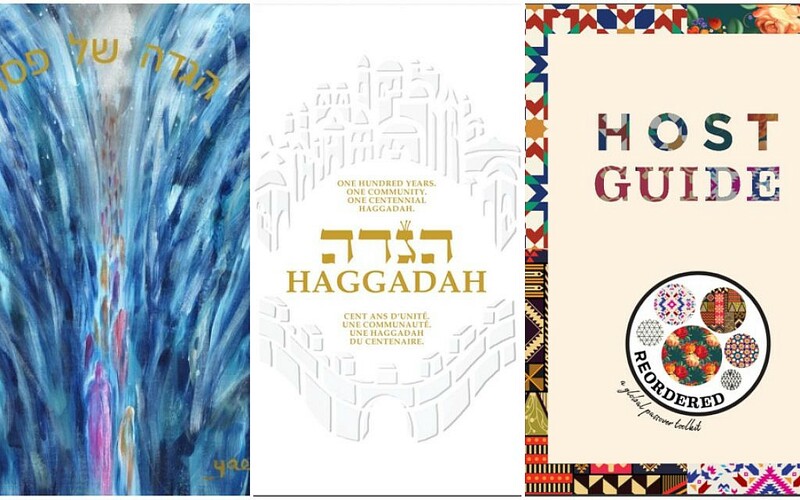 The Haggadah joins a growing list of communities who use Pesach, a time of memory, as an occasion to celebrate their own, unique past. 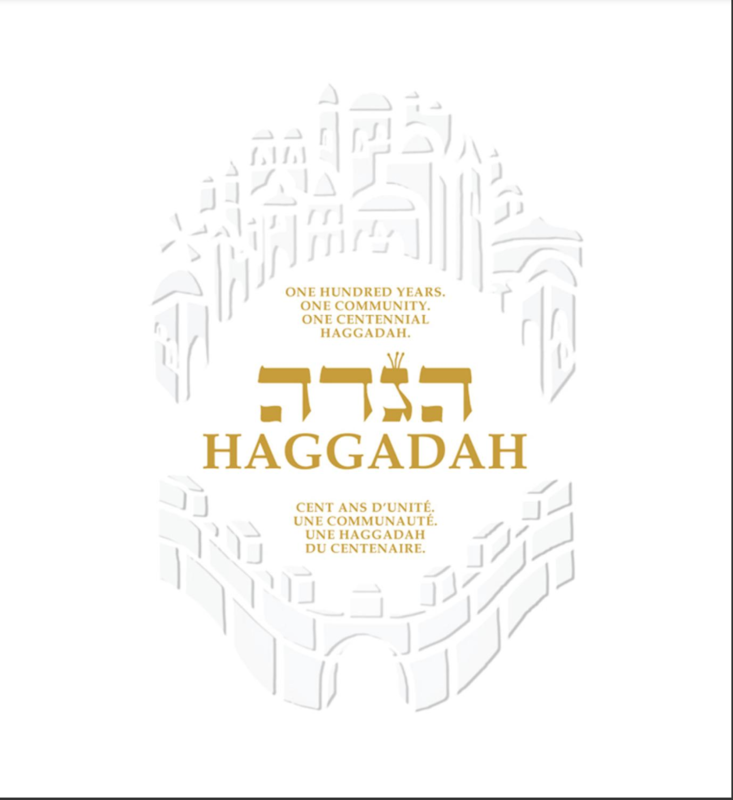 Proceeds from the Haggadah’s sale (federationcja.org/en/haggadah/) go to the Federation’s poverty relief work. Many Jews, especially members of the progressive, social justice-oriented community, have for decades added various Tikkun Olam themes into the readings and discussions of the Haggadah – often with supplements devoted to such topics. Now they have their own Haggadah. Levin, a Chicago native who previously served as an Orthodox rabbi and taught at the Ramaz school in Manhattan, now runs an Escape Room game business as well as bike tours in Milwaukee. “I like to do entertaining things. I like to do creative things,” he says. 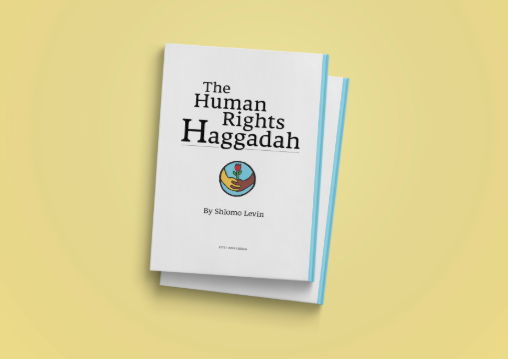 Levin’s Haggadah (hrhaggadah.com), supplemented by simple but attractive graphics, makes reference to such topics as contemporary slavery, Holocaust reparations and reproductive rights. “Rav Schachter on the Haggadah,” adapted by Dr. Allan Weissman (distributed by Feldheim). 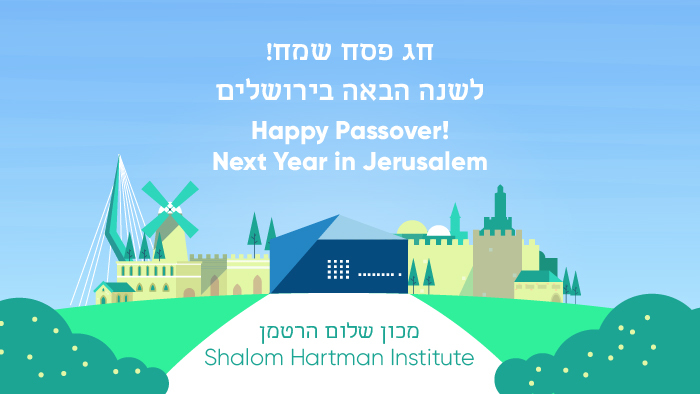 In the spirit of many recent Haggadahs, this is a compilation of Pesach-related lectures and classes by the veteran Yeshiva University Talmud teacher. “The Simply Jewish Haggadah: An Illustrated Get-To-The-Point Guide To The Passover Seder,” (K’hal Publishing), by Rabbi Reuven Epstein. For a seder leader or participants with limited Jewish background, it’s a step-by-step guide to the seder with explanations and helpful instructions. 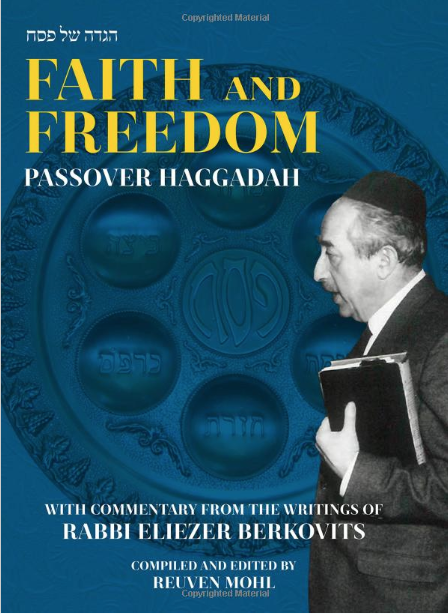 “Pesach Haggadah: Living our History,” (Ayal Press), by Rabbi Reuven Leuchter and Eran Feintuch. A no-frills – and no-art – publication that features essays on many of the evening’s readings and rituals. “The Jewish Veg Vegan Haggadah” is geared for vegans, whose diet eschews any animals or animal-based products. It’s designed to be used at the five vegan seders around the U.S. to be conducted this year under the auspices of the Jewish Veg organization (jewishveg.org), which produced the Haggadah. New York’s community vegan seder will be held on April 23, 7 p.m., at Congregation Rodeph Shalom, 7 W. 83 St., Manhattan. For information: jewishveg.org/Passover-NY. Inside the Haggadah are readings that emphasize the vegan movement’s connection to traditional Pesach themes. Historically, the highlight of the seder was the korban Pesach, the pascal sacrifice that commemorates the ancient Israelites’ killing of the Egyptians’ venerated lamb on the eve of the exodus and the smearing of the animal’s blood across the doorpost of Jewish homes. 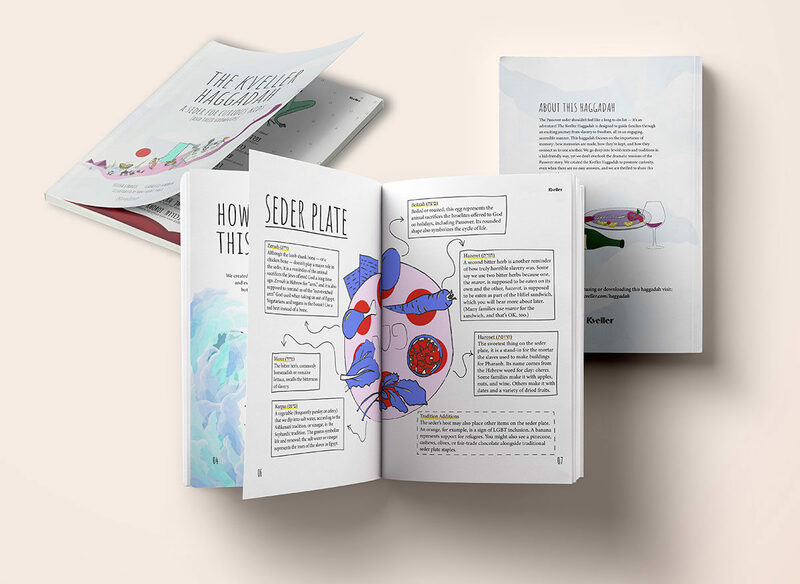 The Haggadah (kveller.com/Haggadah), written by Elissa Strauss and Gabrielle Birkner, with neat illustrations by Hane Grace Yagel, is a thorough introduction for people not familiar with Passover customs. It focuses, “in a kid-friendly way,” on “the importance of memory: how memories are made, how they’re kept, and how they connect us to one another,” according to the introduction. Particularly useful are a series of “WHY?” questions and answers about what takes place at the seder. 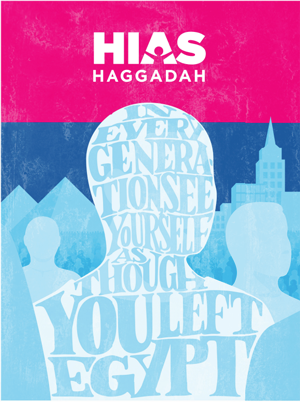 It’s clear that the folks who put together this Haggadah understand how children – and their parents – think. HIAS (hias.org), the Jewish nonprofit that provides humanitarian aid and assistance to refugees from many religious backgrounds, has issued a new “HIAS Haggadah” dedicated to the theme of refugees and asylum. Various readings throughout draw attention to the refugee theme. The rabbi called the HIAS Haggadah “the only fully refugee and asylum-seeker focused Haggadah of which I am aware. The jewbelong (jewbelong.org) organization, which offers a wide range of explanation of Jewish beliefs and practices “for Jewish people, for people who aren’t Jewish but are part of a Jewish community, for anyone who has felt like a Jewish outsider,” offers an eclectic, full-color Haggadah, which is actually a supplement, an outline without the full traditional text. “This elephant has been around as long as the Jewish people, but he is getting bolder and meaner. That elephant, of course, is antisemitism,” the reading states. “There’s the familiar white supremacy movement that pretty much hates everyone who doesn’t look like them, the run-of-the-mill antisemites, and a relatively new form of hate directed at Israel which crosses the line to antisemitism too often. An updated version of an explanation-laden Haggadah offered by the Open Siddur Project (opensiddurproject.org), the “Haggadah of the Inner Seder” is a compilation of instructions, suggestions for further resources, historical background, stories, and insights into every part of the seder. The creation of Rabbi David Seidenberg, who developed the neohasid.org website, this Haggadah features bite-sized commentaries that will not add to the length of the evening. American Jewish World Service (ajws.org): An extensive social justice Haggadah, discussing seder themes in light of AJWS’s international work. T’ruah (truah.org): A “Refugee Seder Supplement” dedicated to the current social justice issue of refugees, immigrants and asylum. Jewish Foundation for the Righteous (jfr.org): A Dayenu reading on non-Jews who saved Jews during the Holocaust; this year, an unsung Polish man. Hazon (hazon.org): “The Egg on the Seder Plate” discusses the symbolism of the “often overlooked” Passover egg, and its dual meaning in Jewish tradition. Ritualwell (ritualwell.org): Interesting, philosophical essays on the symbolism of many parts of the seder. One Table (onetable.org): The hospitality-themed organization offers an on-line page-flip supplement, and supplements prepared by several other Jewish groups. Hadar (hadar.org): A guide to the “Inner Seder” that offers instructions to background on each step of the evening’s activities. Jewish Voice for Peace (jewishvoiceforpeace.org): A reading for the breaking of a piece of matzah – “part of the process of creating anew” – and a JVP Haggadah. And, not strictly speaking a Haggadah supplement, the online “Creating fun resources for teaching Passover!” guide from jewishinteractive.org, an educational organization, offers several technology-based programs that can be used, in advance for greatest advantage, to prepare for the seders.